When you need to order supplies in order to ensure the swift delivery of your shipments the Royale International are on hand to help. Packaging materials need to be strong and secure to protect your shipments as they are delivered from one part of the world to another with the help of international couriers. The Royale International are able to supply low cost yet sturdy packaging materials to all their customers as and when they are required. When you run out of packaging it can lead to unnecessary costs when ordering from a new supplier, delays in shipments and unhappy customers. If you need new materials simply contact the leading international logistics providers, Royale International Group and place an order. You can do this by emailing them directly with your request at supplies@royaleinternational.com or by calling +852 2318 0370. Within two days your new materials can be delivered allowing business to continue as usual. 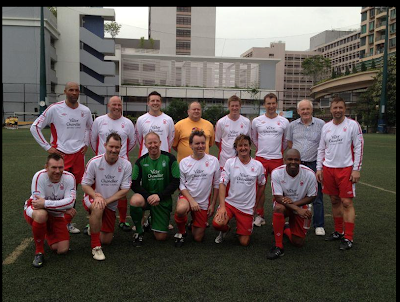 For the third year running, Royale International welcomed a team of Nottingham Forest veterans over to play in the Citibank Soccer 7's tournament at the HK Football Club. A hybrid team of former Forest legends and a handful of Royale's own footballing legends joined ranks under the guise of the Nottingham Forest Mobsters. The tournament began on Friday evening with a game against rivals the HKFC Chairman's Select. Despite taking an early lead the game finished at 1-1 after a free kick levelled the tie for HKFC. Saturday saw some attrocious weather but some sparkling football as the Mobsters recorded a 3-0 victory over Thai visitors Bangkok Airways followed by a convincing 1-0 victory over the Citibank All Stars who featured Ali McCoist and Lorenzo Amoruso in their side. This put the Mobsters into the main cup competition quarter finals for the Sunday with a draw against HKFC veterans side. Sunday saw further torrential rain but that didnt stop the Mob from dispatching HKFC 1-0 and taking us to the semi-finals for the first time. 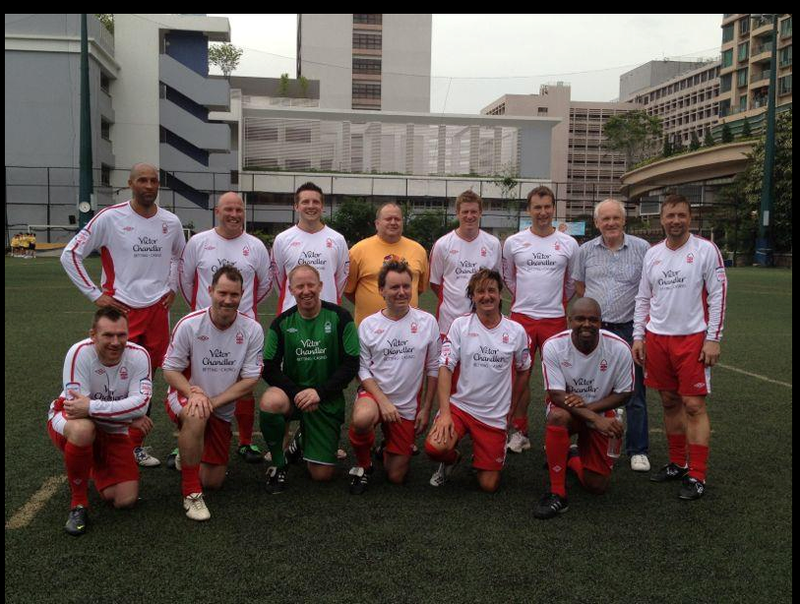 Opponents were Top Class FC, a team made up of former Hong Kong international players. Despite taking a 2-0 lead, Top Class drew level with a late equaliser and the game went to 4-a-side sudden death. In what has been voted the most entertaining match of the tournament, possession changed hands 5 times, the woodwork was struck once and Des Lyttle in the Mobsters goal pulled off two breathtaking saves. Alas, it was not to be as Top Class finally found the net to end the Mobsters challenge for 2012. We look forward to next years competition with the aim of going one step further. One of the great advantages of using a modern and experienced International Logistics firm is the flexible and versatile services you will be able to receive. Take ordering for example, you have a range of choices to choose when you wish to book a collection or a shipment. If you are wondering how to place an order with the Royale International Group read on for some simple tips. Place your order via email. It is possible to place an order or request information by emailing the right department. To find the email address for your location visit the Royale International website and locate the contact page. Phone services. For those of you who prefer voice to voice contact the telephone service is the best option to choose. Professional staff are waiting to assist you. Again you will find the contact details on the website. Filling in the online form. If you would like to receive information or place an shipment order fill in the online form found on the website. Choose the method you are most comfortable. The service you receive will be excellent no matter how you make contact with the international couriers. Some of my clients are farsighted which is not good for reading small text. I will specially prepare quotes in a larger font and highlight the related item for them. Then, I will make an appointment to chat about it in detail. I like cooking and baking, and sharing them with my family. I get disgruntled when somebody cuts in line when queuing for public transport. "Thinking positively will make one have positive working attitude". A good organisational structure and administrative systems in Royale give me confidence to confront the ever-changing market and challenging tasks. Royale International continue to provide leading international courier services in Hong King and all over the world. Their offices, warehouses stretch far and wide helping to ensure the best service possible to their customers. If you are seeking the finest service to manage and expertly deliver your goods to any part of the world the Royale International Group are ready to help. The best place to start is to look online at the Royale International website. You can find the contact details of local and international offices, or contact the team of experts over the phone or via email. The trained staff are waiting to provide you with all the information you need. Becoming a customer of the international logistics leaders will open up multiple available services to you. The services can be tailored to your requirements, and are available 7 days a week, 365 days a year. There is no time off, your shipments can be made a priority no matter where you want them to be delivered. Remember to ask about any special offers when you speak to your sales representative. Alternatively you can see the latest deals on the website to see if you can save even more money by using Royale International. There are many international couriers out there, but not all of them will complement your business. All businesses are different, and they require a courier that is flexible and able to customise their services. The Royale International Group believes in providing a personal service to all their customers, big or small. If you require a shipment sent the same day the Royale International Group will do everything possible to accommodate you. There are multiple services available for same day pick up including domestic services, next flight out and time critical services. For those all-important items you can even request the professional trained hand carry couriers who will take your order on the next available flight and ensure it is delivered safely. The international logistics providers are available seven days a week, all year round. This means you can have your orders and purchases picked up and delivered on weekends, holidays and even in the evenings. This flexible and reliable service is why Royale International has become leaders in their field in Hong Kong, and they are continuing to thrive throughout the rest of the world. Keeping up with the changes on how people shop is important for business looking to keep up. It is vital to move with the times and change to meet customer demand. One of the ways that customers are changing is by reducing the amount they spend on the high street and focusing on shopping online. If you have been struggling to continue selling at high levels in your rented high street store perhaps it is time to move with the times and create an ecommerce shopping experience. International couriers are able to assist businesses who sell goods online. The customers visit your website, place their order and couriers handle the deliveries. The Royale International Group can help businesses of all sizes to become established and provide excellent customer services. The courier services range and include overnight international deliveries and same day deliveries. In addition to the courier services the Royale International Group is able to provide warehouse space. As your business expands online you may require more space than you have available. You may also find that the amount of work you have exceeds your available staff. Choosing the Royale International Group allows you to expand and make use of their trained employees to manage your inventory, store your goods and pick and pack all shipments. Visit the website for further information. If you follow our blog you will be aware that the International Couriers, Royale International have frequent special offers running all year round. Currently you can take advantage of money saving deals, ideal for all businesses requiring international deliveries to Australia or South Africa from Hong Kong. Here is a selection of the latest deals not to be missed. Take advantage of the money saving 40% discount offered for air freight shipments heading to Australia from Hong Kong. Royale International is offering amazing deals on overnight deliveries to South Africa. If you have shipments planned to be sent to Durban, Johannesburg or Cape Town from Hong King this is the deal for you. You can send your shipments heading to Sydney, Melbourne and Brisbane for amazingly low prices, starting from just HK$100. Visit the website or speak to a sales representative on +852 2318 0370 for more information regarding the deals or check out the PDF information sheets online. I have helped customers after our office hours or during holidays to solve their problems and answer their questions. Hanging out with friends and family, with good food and wine. Cooking, seeing performances and travelling. I don't really have many but sometimes I can be upset by some ungracious people. "Think good, do good and say good" or "Try your best". One of the ways the Royale International Group look after their customers is by providing excellent track and trace services. When using overnight international deliveries it’s important to offer all customers a choice of ways to trace the package or shipment, no matter how large or small the order may be. The international couriers will ensure all information that is sought after by customers is completely up to date. Those checking in online will see the location and know whether the delivery is on schedule or running late. Customers also have the choice of finding out the location of their packages via email and even via SMS. Wherever the customer may be they will be able to locate their order status using these excellent trace and tracing facilities. By providing such high standards of customer services the Royale International Group are able to help businesses of all sizes with their day to day activities. If you would like to find out more visit the Royale International Group website or call your local office and speak to a sales representative. As businesses grow it can be difficult to deal with expansion and find the funding to support the next step. If you are working in retail and suddenly find the number of orders you are taking exceeds expectation you could find that the storage space you have is no longer suitable. However, perhaps purchasing or renting a new warehouse or moving premises is not on the cards just yet. If you have found yourself in this position the International couriers, Royale International Group could be of assistance. The Royale International Group is able to help you by offering customisable international logistics. This includes everything from handling your deliveries and shipments to providing warehouse space and storage facilities. The warehouse, logistics and distribution service is managed by trained experts that will help you to successfully manage your inventory, provide reverse logistic services, pick and pack and cycle counts. You can also choose the types of international courier services you wish to use, including next business day, domestic deliveries and even next flight out. If you need to expand use the warehouse services provided by Royale International Group. Visit the website to find out more about this fantastic service and how it could be of benefit to your business. If you are a small business or work as a self-employed worker from home you may be concerned about expenses. When you have to ship products or marketing materials the costs can quickly add up. If you work with established international couriers you may also find that there are serious delays due to the lack of experience and knowledge the company has when providing international services. It is possible to find the right type of service for your company and use one of the leaders offering international overnight deliveries. Thanks to the flexible and customisable courier solutions offered by the Royale International Group it’s possible to find the right deals that fit in with your budget to help your business continue to thrive. The Royale International Group have year round economy flights, frequent special offers and a team of trained and experienced representatives ready to help put your plans and requirements into action. Find out more about the affordable courier solutions suitable for all businesses, large or small by contacting the team at your local sales office. Royale International are leaders in offering time critical services, used by many of the top Fortune 500 businesses. Thanks to our time critical services business, like yours, can have any item delivered as quickly as possible, and taken care of along the way with trained hand carry couriers. The International Couriers are happy to work around your requirements. If you require a document hand delivered in Paris by the next day that can be arranged. Perhaps you have a sample which needs to be in Australia as soon as possible, the hand carry courier will personally take your sample on the next possible flight and ensure it is taken care of and hand delivered. You can find out more about the services offered by the Royale International by watching the short video below or visiting the Royale International Group website. Read article in our community section here..
Reducing the carbon footprint of a large organisation such as the Royale International Group is always going to benefit everyone. International couriers can contribute greatly to the amount of carbon dioxide that is released into the atmosphere. That's why it is vital to try and reduce fuel emissions as much as possible and incorporate a strong eco-friendly based office management strategy, after all every little helps. The international overnight couriers, Royale International, have found a way to reduce the carbon footprint by getting rid of the hub system. Many other couriers uses a hub which receives all packages and shipments once they have been collected from the pick up point. From there the orders get distributed out to their destination. Often the hubs are many miles out of the way which means each and every parcel and package uses more energy than necessary to arrive at its destination. The Royale International use a completely different system. There is no hub, so all orders are collected and from there they head out on the journey in the most direct route possible. There is no wastage of fuel and it's also a lot quicker. Pay a visit to the Royale International website to find out more about the corporate responsibilities of Royale International. Larger shipments can be easily distributed using air freight services from International Couriers. The Royale International Group is able to ship bulk orders and high volume deliveries to any part of the world. Air freight is fast and it can be cheap if you choose to use the courier services of established and competent firms able to work quickly and efficiently. Having knowledge on how the different customs work in different parts of the world ensures the right paper work is submitted, helping to speed up the process. The Royale International Group can be flexible helping you to make full use of the service. If you wish to customise the service you only need to telephone your local sales representative, the local office or send an email with your enquiries. You can choose the bulk shipping option at any time of the year as the international logistics experts work 365 days a year. There are some excellent money savings offers right now such as the economy overnight deliveries to Australia. If you wish to find information on the latest offers all you need to do is visit http://royaleinternational.com/special.php. Do You Need to Use Hand Carry Courier Services? The hand carry courier service provided by the Royale International Group is highly popular with Fortune 500 companies. When you have an urgent package which needs to be delivered quickly and efficiently the hand carry option is a good choice to make. It's not only available for large organisations, any one with an urgent delivery is able to make use of the customisable service. Sometimes a package or document has to be in another part of the world within hours rather than days. On these occasions overnight delivery simply will not suffice. Hand carry couriers are trained to handle your vital package and carry it on flights to ensure it reaches it's destination safely and as quickly as humanly possible. To arrange your hand carry service you need to contact your local Royale International Group office. You can email your request and a plan will be created detailing the next suitable flights and pick up time for you to consider. Your package can be picked up within a few hours and will head out on the next suitable flight agreed by you. It's fast and it gets the job done. It's not always possible to track deliveries, especially ones which have a long way to travel. Online tracking often involves finding out when the packages arrived at the hub point and then when it has arrived. This types of information isn't exactly useful, especially if you are trying to provide real time information to your colleagues, bosses or customers. The Royale International Group do things differently. You are able to trace and track each of your shipments in three ways, and receive up to the minute information. The tracking options include online, SMS and email. This is a fast, simple service designed to make your life easier by providing you with the information you need, when you need it. Another benefit of using Royale International for your international overnight deliveries is that they don't take any packages to a hub point. Instead the international couriers use a point to point system. Your packages are picked up and sent directly to their destination, saving time, fuel and money. To request a courier service visit the Royale International website and contact your local office today. Businesses are like humans, in fact many people think of their business like their child. They are all different. What works for one business won't work for another. If you run your own company you will have systems of work which might not fit in with those of others. The problem with this is that out of the box services, such as overnight delivery services might not fit with your business times or methods of work. All is not lost, there is no need to make special arrangements when it comes to organising international logistics. Royale International are different to many other couriers as they are flexible and happy to customise all of their services to help fit in with your business and your personal requirements. If you need something collected the same day you can have this arranged. Perhaps the due date falls on a holiday or the package needs to be delivered to another country within hours not days. There are solutions to be found for all of your courier needs. Contact your local sales representative to find out how the Royale International Group will tailor their services to suit your business. One of the ways you can improve your customer services is by working with a strong international courier. Your products may be of the highest quality, however, if you are using a slow system of delivery you could be turning your customers off, and reducing the chances of returning clients. Your reputation can be severely damaged through word of mouth and social media platforms, so it is worth spending time finding the right couriers for your company. The Royale International Group understand that the services they provide can have a huge impact on your customer's satisfaction. With such a large responsibility placed on their shoulders they ensure they are able to serve you and your business well by providing speedy overnight deliveries, multiple methods of tracking and cost efficient services allowing you to pass on the savings directly to your customers. If you would like to find out more about how the international logistics providers are able to help improve or maintain your customer services don't hesitate to get in touch. You can call your local Royale International office, visit the website or send an email for help from the professionals. There was an evening after the cut-off time when a client asked for a shipment (weighing a few hundred kilos) to be delivered to Chittagong, Bangladesh by the next morning before noon. To complete this almost unachievable request, we had less than an hour to pick up the shipment and get to the airport to catch the last flight! We made the deadline for the delivery using our Time Critical Service and the client was very impressed - if this vital order had been late it could have caused a huge loss (several million) for their company. Travelling to see famous architects, car cruising, aviation pilot studies, movies and music. It annoys me after a long day at work if I miss my bus home. It's another 15-20 minute wait for the next one and when the bus comes it's 110% full and without any seats! "Always try to put yourself into someone’s point of view before commenting". My job allows me to use my creativity flexibly and also provides me plenty of opportunities to explore new elements, thinking and knowledge that could take double/triple the time if I worked somewhere else. I also get the chance to travel outside the country, to explore different cultures and personally discover what the situation is like in the global environment. The people at Royale are all friendly, helpful and enthusiastic. When you are using an international courier, it is worth remembering that you don't have to be sending shipments abroad to use their services. Firms such as the Royale International Group are more than happy to handle any domestic courier orders you wish to give them. What's more your order will be treated with the same high priority as any international orders you place. Royale International domestic services are available to anyone at any time. You can choose to have your orders collected as a matter of urgency, collected and delivered on the same day if you require it. There are other services too such as the overnight delivery by air and by road. Just because you do not require packages transported over the other side of the world doesn't mean you can't use the respected services of Royale International. Find out more about the various domestic services available for the leading international logistics company in Hong Kong. Have you ever found yourself talking to an irate customer wondering where their package is? Perhaps you have had to apologise to a client for not being able to have a vital sample arrive for a meeting on time. When international logistics are poorly managed issues like this can easily arise. Through no fault of your own you can be placed in the firing line with little power to rectify the situation. This is why it is vital to choose your couriers carefully. By using the Royale International Group as your international couriers you can help to ensure that delays will not leave your customers cold and angry. If problems were to arise you could quickly login and discover exactly where the package is to inform your customer. Being able to give an accurate time frame is hugely beneficial in times like these. Similarly if you find that a sample has been left behind which needs to be at a meeting or in another part of the world the Royale International can help. Use one of the hand carry services to ensure the part arrives at its destination by hand and as quickly as possible. Avoid problems by using the right international couriers, and should problems happen, choose the services from the ones who can help you quickly and efficiently. When it comes to running a business there is so much involved. If you have a small work force and even smaller budget you can quickly come up with a lot of serious issues. How can you process all your current orders while finding new ones? How can you store all your stock with limited space and no money for a warehouse? What can you do about training staff for each part of the job? This is why small businesses commonly outsource their international logistics to experts, it saves time and money. International overnight deliveries can be cost effective and fast. There are lots of great deals to be found and if you use a great company like Royale International it's possible to have the service customised to your demands. Need a later pick up? No problem. Want to hire some warehouse space? That's possible. Need to give customers a fast service? You can. Royale International will work with you on any part of the logistics process and help your company to perform as it should. If you want to find out more visit the Royale International Group website for more information, or pop in to your local office and speak to one of the trained staff. China has had a successful April with the key manufacturing gauge seeing a significant rise. It's currently at a thirteen month high, although this is not a time to relax or sit back. The current economic cloud still looms and small businesses are finding it hard to compete. The manufacturing index is not the only area of improvement, as the Purchase Manager's Index also rose to 53.3 in April. According to the China Federation of Logistics this is the highest it has been since March 2011.This is good news for consumers and manufacturers and is a good sign that things could be on the up. International logistics providers are working hard to help businesses of all sizes compete and keep up with the new demand through their affordable and customisable courier services. Choosing the right international courier services in China is vital as many companies are not able to manage the logistics effectively. Choosing the leading logistics providers, Royale International, ensures a great service and efficient service both internationally and domestically. You can rely on their experience and extensive knowledge of the infrastructural which helps to stop delays and ensure your shipments arrive in time, whether they are for within your business or heading out to consumers. When you use international couriers you need to abide by the rules put in place by customs. All paperwork must be complete and included with all dutiable and non-document shipments. This is either your Proforma or a commercial invoice. You will need to give three copies, one of which must be original, the other two are photocopies. What's a Porforma Invoice and When Should You Use One? A porforma invoice is required if the packages you are shipping are samples. If you are shipping sold goods you will need the commercial invoice and not the porforma. If you do not know what one looks like there is a free copy available on the Royale International Group website. As all laws and regulations regarding customs differ from country to country it is best to check any concerns you have with your local sales rep regarding filling in the forms and what's allowed. If you are filling out th blank porforma for the first time you can use the free sample document also found on the Royale International Group. You will find all the advice you need to help you do the job right first time and avoid any delays. Find out more about customs, documents and the international logistics services by visiting www.royaleinternational.com. Since the 1980's Royale International have been providing express delivery services starting in New York and then into London in 1982. In 1993 the firm expanded into Hong Kong and the Royale International Group quickly began to really take off. While many international couriers in Asia are struggling to provide a quality service to their customers, Royale International are able to fall back on their extensive history in the courier world, and over 19 years of experience helping businesses in Hong Kong and all over the world with their international logistic solutions. If you require to partner up with a logistics company it makes sense to use one with strong roots. Why risk delays, expenses and poor customer service when it is possible to receive a great service with a trusted and respected firm? Since 1993 there has been an abundance of Royale International offices and warehouses opening all over the world. With more in the works it makes sense to use a firm of international couriers with an excellent spread all over the world. If you wish to find out about the various services available and locate your local office visit the Roayle International Group website to find out more.